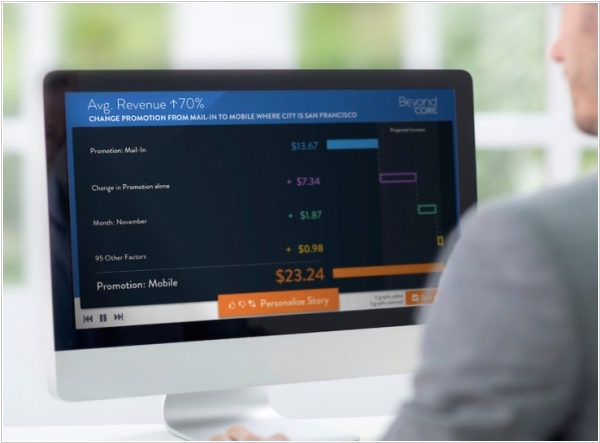 Salesforce has acquired business analytics platform BeyondCore. It is an enterprise analytics tool that bolsters business intelligence with computational and statistical analysis. While Salesforce could have gone fishing and come up with a number of business intelligence companies to buy, BeyondCore was already integrated with the Salesforce platform. Whether the transaction will turn out to be a critical key in an assault against Microsoft, or simply a strategic acquihire is yet to be seen. Until then, we will be eating popcorn waiting for the next Salesforce acquisition. 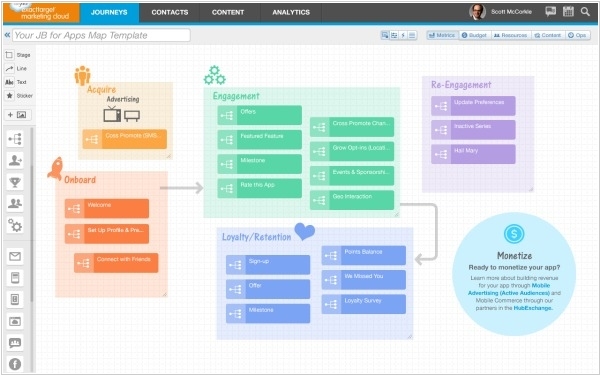 Salesforce.com has announced a new version of its Marketing Cloud. It’s adding new features to its Journey Builder, a drag-and-drop tool for managing customer interactions, and to Active Audiences, which connects customer data to online ad campaigns. 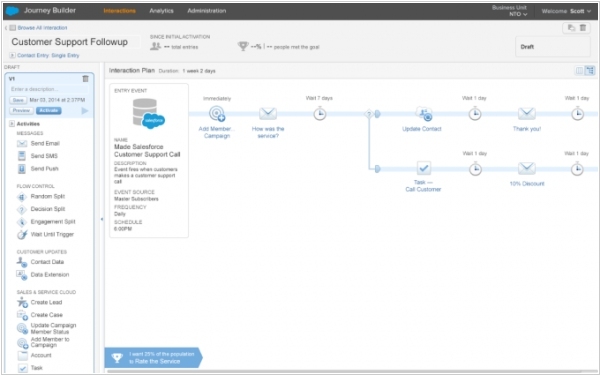 Journey Builder adds “Native Journeys” feature that integrate with its existing Sales Cloud and Service Cloud. That means marketing teams have more capabilities when designing journeys that cross over between the marketing, sales and customer service teams. 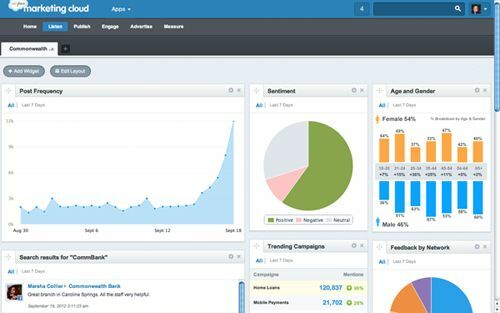 It’s also announcing new, pre-built triggers that use interactions like joining a loyalty program or downloading an app to begin a customer journey.Salesforce is also enabling advertisers to do more with that data, specifically by integrating its Active Audiences targeting with a number of display ad networks, including LiveRamp, LiveIntent, Neustar and Viant. Journey Builder for Apps - the new tool in ExactTarget Marketing Cloud is available today for customers. It helps users deliver personalized customer journeys directly from mobile apps. It also allows customers to use the Salesforce CRM platform to connect the customer journey across sales, service, marketing and communities. With this new tool you can build journeys fast with Journey Templates, connect apps to any customer interaction, connect locations and products to the journey, build, scale and deploy engaging, transformational apps. Pricing for Journey Builder for Apps starts at $12,500 per year for a subscription license. Salesforce acquired several startaps in marketing space, an now don't want to offend any of them when inventing title for the integrated product. So, it's called "simply" Radian6 Buddy Media Social Studio for ExactTarget Marketing Cloud. It's a single platform for social content marketing, engagement, publishing and analytics that also allows marketers to collaborate. And with the Social Studio mobile app, you can run social marketing and engagement from your phone. The features include workspaces for team collaboration, tools for planning and publishing social media content, for interacting with customers, and for examining the results through analytics. At launch, the Social Studio integrates with stock photography services Getty Images and Shutterstock, as well as content discovery tools Kontera, Trendspottr, and Rallyverse. Microsoft marketing people couldn't get enough of their cool marketing idea. On the street near the conference center, where the Salesforce's Dreamforce conference takes place, they send their people on segways with banners (on picture). 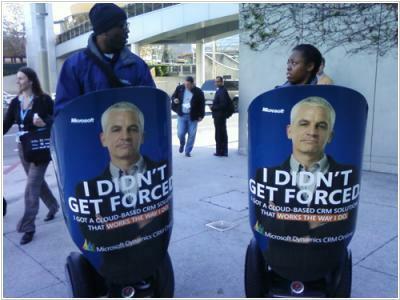 The banner shows a dissapointed man, who has moved from Saleforce to MS Dynamics CRM Online. Under his photo there is a strapline: "I didn't get forced". But Microsoft marketers did not know whom they are dealing with... In the beginning of the second coference day Mark Benioff, Salesforce CEO, entered the stage... He said: "Yes, it's true. It happens that customers go away. We don't have that many unhappy customers, but it happens. You gotta turn those customers around, you gotta bring them back. Suddenly we see this customer getting forced everywhere. We can make this customer a success again, but it will take the collective will power of the Salesforce nation." And at that moment, Bernard - the very same unhappy forced customer from the Microsoft ad - appeared on the stage. "So, Bernard, will you come back and get forced again?" - Benioff asks him. Bernard thinks. "Friends, let's support Bernard!" - Benioff says to the audience. 14,000 delegates get onto their feet to make Bernard rethink his decision and come back "Yes" - says Bernard "YES!" - says Mark ...and a manly hug!